Monteith’s decided that the bar needed to be raised in regards New Zealand's to cider and have succeeded with this great tasting beverage. 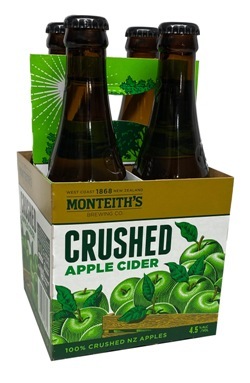 Monteith’s crushed apple cider is made from 100% New Zealand grown apples, that are picked when fresh and sun ripened. After being crushed and fermented for 3 months, Monteith’s have a great tasting cider, which is unbeatably refreshing when poured over ice. Stumbled across Monteiths Crushed Apple Cider on a recent trip to New Zealand. Best cider I have ever tasted. Bought some from Sanza and have to admit it tasted just as good. Best cider in the world! We recanted toured NZ, and she to the Monteiths Brewery in Greymouth. Did he tasting tour, which was fabulous, and was an instant convert to Monteiths Crushed apple Cider. Discovered Monteiths during a trip to New Zealand and haven't tasted a better cider since. Hits the spot every time! Whilest traveling in the uk I discovered the crushed apple cider and fell in love with it!